You are here: Home / Hiring a Dog Walker / When Will Trusty Tails Visit My Pet? Our staff will be at your residence and checking in via the online scheduling portal within your requested time frame. Should your regular walker or sitter be unavailable, we’ll make sure that your backup sitter still makes it to your pet at your regularly scheduled time. No pet is ever left unattended! We understand that some pets require attention at a more specific time than a two-hour window, so we’re happy to accommodate you if you let us know. While scheduling, feel free to make a note that your appointment is time sensitive for whatever reason (medication, potty training, etc.) 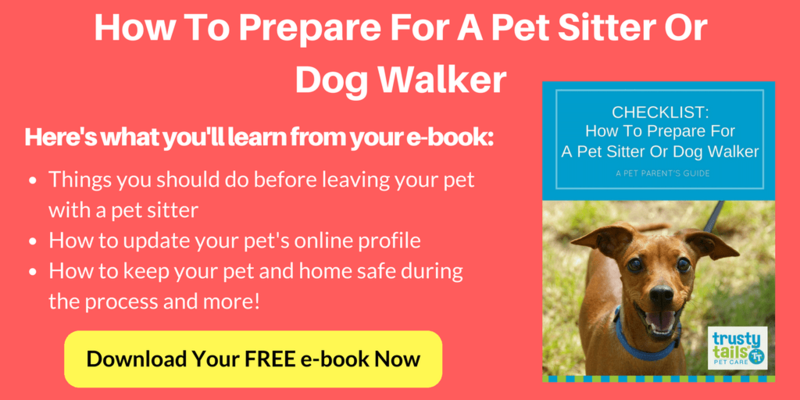 and what time your pet’s needs are sensitive to, and we’ll be sure to have a walker or sitter there at that time. When you become a part of the Trusty Tails family, we treat your pet as we’d treat our own, and we know how hard it can be to spend all day away from your furry friend. You never have to worry with us, though – our trained and professional staff is always ready to care for pet at whatever time you need! Contact us today through our site or call us at 201.446.1559 or Book Your Sitter Today. Next Post: What Happens During A Trusty Tails Meet & Greet?